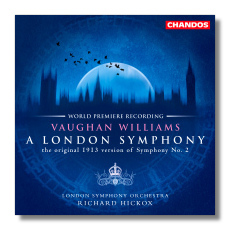 Symphony #2 "A London Symphony"
As well as being a close friend, it was at Butterworth's suggestion that Vaughan Williams expand a symphonic poem into a symphony. Butterworth was one of the British composers who died in World War I and although he left only a small number of works, his influence was substantial. Vaughan Williams revised this symphony considerably and those familiar with the final version will find that there are about twenty minutes of additional music in the original, although the first movement is all but unchanged. The overall effect is to make the symphony darker and edgier. Although some may prefer his final thoughts, it's very instructive to be able to hear the original. Hickox's cycle of the symphonies also includes the otherwise unrecorded Norfolk Rhapsody #2 (Chandos CHAN10001).